lastminute.com has announced a talking phrasebook that is free to download for iPhone and iPod Touch users in the UK. You can get French, German, Greek, Italian Portuguese and Spanish versions, so if you’re travelling to any countries that speak those languages, I suggest you get them onto your iPhone sharpish. The talking phrasebooks also feature a new search functionality. Users can now search for all phrases quickly and easily, so holiday makers do not waste any of their precious time. They also have a list of activity based words and phrases, so now you can ask to go skydiving in Spain, or on a helicopter ride in Portugal. The phrasebooks also include localised options such as playing boules in France, or visiting a Greek ampitheatre. French, German, Greek, Italian, Portuguese and Spanish. Disclaimer: I’ve been doing some work for Coolgorilla. Is battery life making the term ‘mobile’ redundant? Here’s a second chance to see another post that originally appeared over Christmas. I’ve recently bought a G1 and the battery life on it is shocking – less than a day of normal use seems to be the average so far. And if you use extra functions like GPS it seems to be even less than that. Fortunately for me I don’t use it as my main phone – I use almost exclusively for data and it’s not ‘mission critical’ to me if it’s dead for a while. The G1 isn’t the only phone with poor battery life. There have been numerous reports of the iPhone’s poor battery – especially the 3G. If you search on Google under ‘iPhone poor battery’ you get over 250,000 results. If you want to read a more detailed analysis of some of the technical issues, you can read Dean Bubley’s post here. But I’m not interested in the technical background to this. Like the majority of mobile users I don’t care whether it is the fault of the hardware manufacturer, the software, the network or any other reason. What I do care about is that I’m getting a poor performance from my phone. I want my phone to allow me to be connected while mobile. The main form of connection obviously is that I want to be able to make and receive voice calls – I want to be able to talk to people while I’m away from a landline. I also want to be able to send text messages. Now, I’ve got a ‘clever’ phone which also allows me to check email, go on the internet, check my location or get directions, play games and a whole host of other cool stuff – I’d like to be able to do that while I’m out and about too. But it seems that I can’t – I can’t be truly mobile because I’ve got to make sure that I’m close to a power socket every 24 hours or so. So what to do … Well as a user I start to rationalise my usage. What’s most important to me – well firstly it’s being able to receive calls, then it’s the ability to make them, then it’s all the other stuff. So I just cut back. Firstly on all the other stuff, then if the battery’s low on making calls too. If my battery’s low, I’m effectively carrying around a pager. I’m not sure that’s what all the new, exciting smartphones were intended to be … but without decent battery life that’s all they are. 12 Days of Christmas – Is battery life making the term ‘mobile’ redundant? Apple has recently let it be known that its app store has now had over 300 million downloads. The company didn’t reveal how many of those apps were free and how many were paid for, but either way, it’s a lot of new things that iPhone users are playing with on their phones. You can read more about it on FierceMobileContent here. The other question that of course remains unanswered is how many of those apps were downloaded by tech-savvy individuals who would have got hold of them anyway, and how many were downloaded by people new to mobile content? The answer of course is that some must be new. Thanks to both the handset itself and the app store a whole range of people have been introduced to cool new apps they never thought possible. Is the iPhone changing mobile behaviour? The anecdotal answer would immediately be yes, so here’s a really interesting anecdote from Ewan of Mobile Industry Review (I’ve copied his entire piece, or you can read it here). I’m standing on the Vomit Comet from London Liverpool Street to Southend Victoria. This train leaves at 2315 and is usually one of the first to attract the drunken dregs of Essex. And the odd sane and sober individual hiding from cold, hard reality with a pair of headphones and an ability to avoid projectile vomit with a skill honed over years of experience. I’m standing. Which means there is no sodding space to sit and that I have a birdseye view of proceedings. So whilst an arse in the middle of the carriage is relating a tale about a box of margarine and a recent sexual experience at 200% volume, my attention was drawn by a lady sat by the door. I was able to look over her shoulder and see Prison Break (latest series) playing away on her iPhone 3G in her lap. She’s overweight – “plump” – she is literally wearing a pink Anorak, she has bleached blonde long hair and she’s weathered to at least, by my reckoning, 45+ years. This, ladies and gentlemen, is your new power handset user. Think you’re all smart with your N95s and N78s? Think again. I’ve just seen her use a TV listing application, the web (Facebook and some Googling), some music and the Prison Break TV episode. Oh, and the text message function. Unbelievable. Fascinating. Truly fascinating. This isn’t a digital obsessed teenager. This is someone who went to school *without* computers in the classrooms. Not even a BBC Micro jobby. And here she is, consuming data and using her iPhone 3G to an extent that, truly, I didn’t expect to see. Her battery is, by the way, totally screwed. I can see the little icon nearing empty. Brilliant! More! It’s great to see practical real life experiences of folk using mobile technology beyond calling and texting. A new app has been launched for the iPhone and iPod touch that gives you access to Zagat Survey’s ratings and reviews of restaurants, hotels etc. It contains details of over 40,000 venues and also includes photos, menus, Google maps, click to call capabilities and functionality that allows users to make instant restaurant reservations. It’s available from the Apple App Store for $9.99. 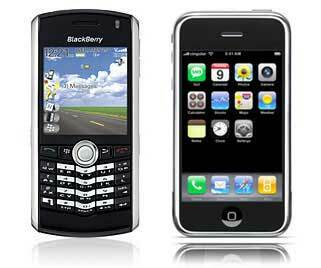 Is the iPhone the new BlackBerry? This is a question I’ve been asking myself for a little while now. Of course I don’t mean the functionality, or the form factor (although the new BlackBerry Storm seems to be targeting the iPhone on both). What I mean by this is the fact that the name has become synonymous with a certain type of device in the minds of ‘normobs’ (as Ewan at Mobile Industry Review calls normal mobile users). A few years ago I was involved in the European launch of Good Technology – a mobile email software provider, subsequently bought by Motorola and now the Motorola Good Technology Group. One of the things we came up again then was that the general public assumed that any mobile device which could send an email was a BlackBerry. As Good Technology could work on a whole range of devices they were keen to dispel that myth. While we had some success, BlackBerry is still the Sellotape of mobile email. Yes there are other brands of sticky-back plastic (as they call it on Blue Peter), but it’s easier to say Sellotape. The same is true of BlackBerry – for most people if it’s doing mobile email then it’s a BlackBerry, even if it’s not actually a BlackBerry. Apple certainly has recent form in this area as most people no longer say MP3 player, instead they are all iPods, even if they’re not made by Apple. Well, it seems the same is happening with the iPhone. For most people outside of the industry, if it is a fancy, expensive looking, ‘clever’ phone then it’s labelled an iPhone. I don’t think it even matters if it is touch screen. So from the N95 to the G1 and including handsets like the HTC Touch Diamond or the Samsung Omnia, they will all be labelled as an ‘iPhone’ or at the very least ‘iPhone-like’. It’s easier, it’s a shorthand. And who can blame regular users. The term smartphone doesn’t mean a lot to most people and if they are chatting to mates down the pub it’s much easier to describe a new phone as, “like an iPhone.” Their mates get it then – it’s clever, it can get the internet, you can possibly play music or show pictures, or play funny games. But most importantly it means it can do more than simply make calls and send text messages. It also means that it’s expensive. I’m sure that most of the other handset manufacturers will hate this and will want to protect their brand. However, they should be embracing it and riding on the wave. With all the marketing dollars that Apple has thrown at one device, combined with the inherent ‘coolness’ of Apple and of course the usability of the device itself; it has made it cool to have a smartphone. Now the other manufacturers need to make sure that they keep getting their products right so that they – and regular mobile phone users – can benefit from this.